Good design is simple. You hear this from math to painting. In math it means that a shorter proof tends to be a better one. Where axioms are concerned, especially, less is more. It means much the same thing in programming. For architects and designers it means that beauty should depend on a few carefully chosen structural elements rather than a profusion of superficial ornament. (Ornament is not in itself bad, only when it's camouflage on insipid form.) Similarly, in painting, a still life of a few carefully observed and solidly modelled objects will tend to be more interesting than a stretch of flashy but mindlessly repetitive painting of, say, a lace collar. In writing it means: say what you mean and say it briefly. It seems strange to have to emphasize simplicity. You'd think simple would be the default. Ornate is more work. But something seems to come over people when they try to be creative. Beginning writers adopt a pompous tone that doesn't sound anything like the way they speak. Designers trying to be artistic resort to swooshes and curlicues. Painters discover that they're expressionists. It's all evasion. Underneath the long words or the "expressive" brush strokes, there is not much going on, and that's frightening. When you're forced to be simple, you're forced to face the real problem. When you can't deliver ornament, you have to deliver substance. The above was written by Paul Graham and pulled from his site http://www.paulgraham.com/taste.html. myisamchk --sort-index and --analyze happy together? myisamchk is a tool used to check, repair, and optimize MyISAM tables. My company uses MyISAM tables to quickly update a large shared read only reference database. Normal dynamic data is kept in InnoDB tables and the MyISAM reference data is joined in queries. However, it’s worth noting that there are well documented issues, here and here, with mixing MyISAM and InnoDB tables together. From this point we’re going to focus on the step 4, optimizing the table data. After large amounts of data is inserted into a table, step 3 above, it is crucial to refresh the table indexes and give MySQL the best possible chance for the best query execution plan. To do this, you must run OPTIMIZE TABLE, ANALYZE TABLE or use the myisamchk tool when it is safe to use. If the --sort-index option is used with the --analyze option, --sort-index is ignored without an error or warning from the program that the option will be ignored and only a sort index will be performed. If param->testflag is either T_SORT_RECORDS or T_SORT_INDEX, then the else if block that handles the T_CHECK / analyze is never execute. Update the documentation to note the --sort-index and --analyze options cannot be ran together. Update myisamchk to ignore and show a warning that both options cannot be ran together. Update myisamchk to allow for --sort-index and --analyze to be executed together. I just came from the perconalive.com 2012 MySQL Conference Key Note inspired. Peter Zaitsev, Co-founder and CEO, kicked off the key note giving a "state of the union" of MySQL and how the 2012 MySQL Conference almost didn't happen with the acquisition of MySQL by Oracle and then O'Reilly dropping sponsorship. Read more here. Baron Schwartz, Chief Performance Architect, then followed with a lesser technical and more personal presentation of his own roll in the MySQL communicate and how he got there. Leaving a "Office Space" like job programming VB6 and ASP to work for a smaller startup company using open source software. Baron encouraged the attendees to be inspired and work within the community to solve everyday problems by building open source software. Mårten Mickos, CEO, Eucalyptus Systems and previously as CEO of MySQL AB, discussed the history of database servers and his perspective of where MySQL is going and its roll in the cloud. Brian Aker, Fellow at HP, previously the CTO of Data Differential, creator of Drizzle, a Sun Microsystems Distinguished Engineer, and the former Director of Architecture for MySQL, then gave an overview of “Servicing Databases for the Cloud” and announced HP's Open Cloud running OpenStack. When Brain speaks you want to listen, his views and opinions typically become reality and rules. I'm writing this blog post from a Boeing 737 30,000 feet above our wonderful planet that is wifi-enabled, oh how far we have come, filled with excitement for the rest of the week as I have a free ticket to the MySQL 2012 Conference present by Percona. A few weeks ago I was notified by Baron Schwarts that I was one of the Percona ticket winners! My company, thank you Doug, was gracious enough to put me on a plane and allow me to spend the week in sunny California sharping my MySQL DBA skills. Unfortunate for my wife I'm gone and she has to deal with our two kids all by her lonely self - ok the kids are really dogs but still - sorry Laura. This morning I spent about an hour going over the conference schedule and tutorials and I do have to say what a show. If Percona had a motion picture trailer to promote the conference it would be a block buster showing of movie stars, effects and promisses of huge explosions, drama and romance! I have high expectations and I know the tutorials and conference will be a huge success just because of the individuals involved. Percona and the MySQL community have put a lot of effort into planning and promoting the event, so thank you Percona and MYSQL community! I believe the more I understand about the inner workings of InnoDB the better DBA I will be. I do hope InnoDB's global kenel mutex locking is truly fixed in 5.6. To me you have to have a solid fondation to start with and H/W is key to better performance, hope to learn a little bit about SSD here. Ground breaking? - maybe, I'm skeptical about XtraDB Cluster because it falls short just like a lot of the other clustering solutions for MySQL. For example, only InnoDB, no memory temporary table support. I could be wrong - but I haven't found a solution that is just plug-in-play for MySQL, meaning I don't have to change my app to make it work. Hope to learn more here and get some insight of the roadmap. MySQL Plugins - why should I bother? I've heard of them, I use them but have no idea how plugins could be used further. I have my own ideas on what they can do, lets see how easy it is to build my own plugin...I see a blog post here. I use compression in my own application for HIPAA audit logs and its been great, however I know there are issues regarding performance and have not moved to mail application data yet - maybe FB has some tricks up there sleeve. We all have been there - those Zabbix or Nagios pages that say high load or to many threads for a brief period of time. Baron gives great talks about collecting, aggregating, visually and processing data to diagnose server problems. Looking forward to this one. I will be trying to blog the tutorials and talks but no promisses. Don't get burned by RedHat/CentOS default I/O Scheduler of CFQ. A few weeks ago this exact thing happened to me. My company is starting to standardize on CentOS as our default install of new servers and in the past we have always built custom Linux Kernels and packages, one of the defaults for us was to use the deadline scheduler. However - this approach did not fit well into what the rest of the community was using, we found our self compiling packages that were readily available in repositories such as yum. Before we put a server into production a set of benchmarks are ran, typically sysbench fileio and OLTP. The baseline benchmark results were outstanding and showed no bottlenecks for the any of the test workloads within our thread count range. 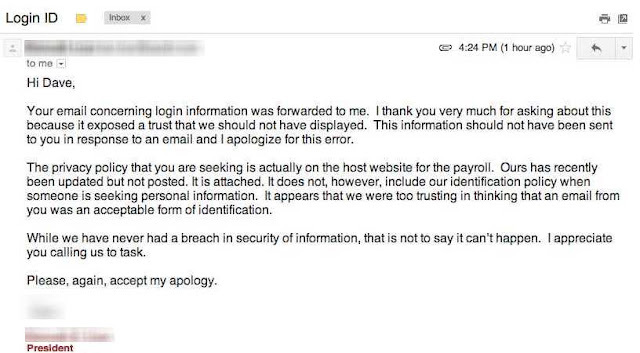 However - once the server was put into production the server started to stalls at times. I switch back to a tried and true slave server and the problems disappeared. I was perplexed, what is going on here? At first it the issue appeared to be related to the well known InnoDB Global Kernel Mutex issue in MySQL 5.0, 5.1 and 5.5 but as I started looking into our Cacti graphing I noticed that the the InnoDB I/O Pending stats on the new server (db3) were much higher than our tried and true server (db1). 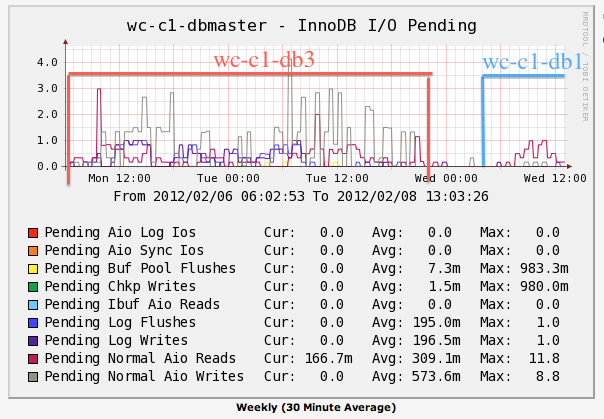 During the same peak time, but on a different day, db1 had less Pending IO than db3. Something must be different between the two servers but what? The best way I know of to get server config info is to run pt-summary on each server and then compare the results. If you are not familier with pt-summary then your missing out! Perocna's pt-summary made the problem obvious and that being db3 was running the default CentOS CFQ IO Scheduler! After making the switch to the deadline scheduler the server's performance has been stable. Why is CFQ the default? When I first initially benchmarked the server, I explicitly set the IO scheduler to deadline, its just something in my benchmark script that happens automatically. As a new user of CentOS, I wasn't aware the default scheduler was CFQ. When the server was rebooted, the I/O scheduler was switched back to the default CFQ scheduler...BURN! If you are running CentOS for a dedicated MySQL server, be sure to set the default I/O scheduler to deadline or noop in your /boot/grub/grub.conf kernel paramaters. Simply add the following line to the end. Last night, I got a page from zabbix warning me of a thread count threshold hit. I was cooking dinner, left the stovetop and walked over into my home office. I run innotop pretty much all of the time on our master server. These three queries were running for over 5 hours, and I would be willing to bet that these queries would NEVER finish. But why?